The exhibition stand of IITA was the cynosure of all eyes at the just concluded World Food Day event, held on 16 October 2017 at Km 28, Keffi Road, Nasarawa State. Enthused by the quality and variety of confectionary and allied products made from yam, cassava, and other locally sourced materials exhibited at the IITA stand, His Excellency, Silas Ali Agara, Deputy Governor of Nasarawa State, Senator Abdullahi Adamu, Chairman, Senate Committee on Agriculture, and Dr Suffyan Koroma, Country Representative, World Food Program commended IITA for their laudable youth entrepreneurship program that is tailored towards agriculture and agribusiness. 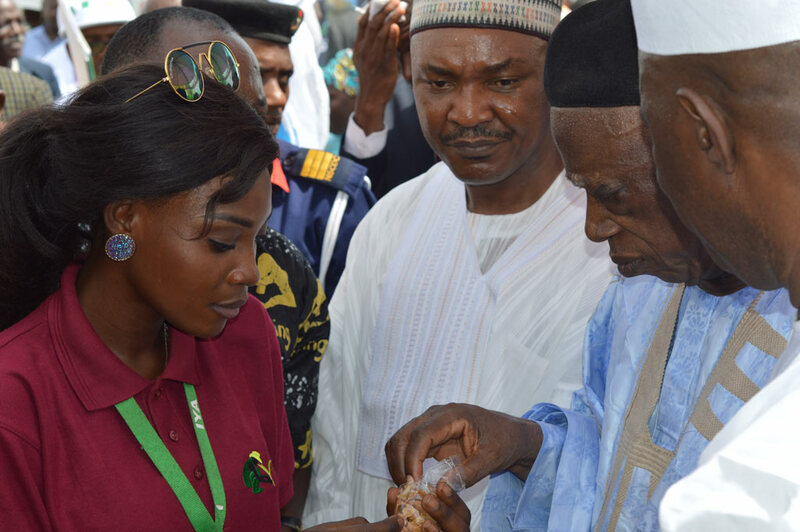 L-R Ms. Bimpe Ayobami, IYA intern, Deputy Governor of Nasarawa State, HE, Silas Ali Agara, and Senator Abdullahi Adamu, Chairman, Senate Committee on Agriculture. The 2017 World Food Day was organized as part of the 10th edition of the National Agric Show. The National Agric Show is a yearly Agric expo organized by the National Agricultural Foundation of Nigeria (NAFN) in collaboration, with Federal Ministry of Agriculture and Rural Development (FMARD) and All Farmers Associated of Nigeria (AFAN). The theme for this year’s event was “Agriculture for Sustainable Economic Diversification and Growth”. According to the Arc. Kabir Ibrahim, President AFAN, this year’s National Agric Show and World Food Day was geared towards showcasing Nigeria’s abundant agricultural resources and products. The Foundation also intend to use the event to consolidate past achievements, identify challenges facing the sector, and chart a way forward for the development of agriculture in Nigeria. In his welcome remarks, Abdullahi Adamu, Chairman, Senate Committee on Agriculture, who is also the Chairman, Board of Trustees of National Agricultural Foundation of Nigeria (NAFN), thanked the participants, especially the Federal Government delegation and development partners. According to him, the large turnout was a demonstration that “Nigeria farmers are ready to answer the clarion call of the Federal Government to bring agriculture to its rightful place”. 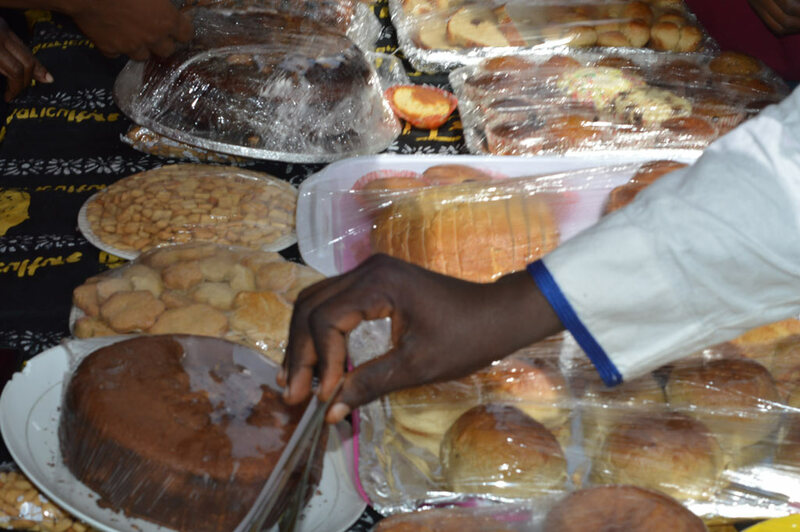 Display of confectionary at the IITA Stand. In his remarks, Deputy Governor of Nasarawa State, His Excellency, Silas Ali Agara stated that the event is an affirmation that agricultural investment remains one of the most important and effective strategies for economic growth acceleration and poverty reduction in Nigeria. He therefore expressed the commitment of Nasarawa State Government to continuously support farmers and agribusinesses in the State. 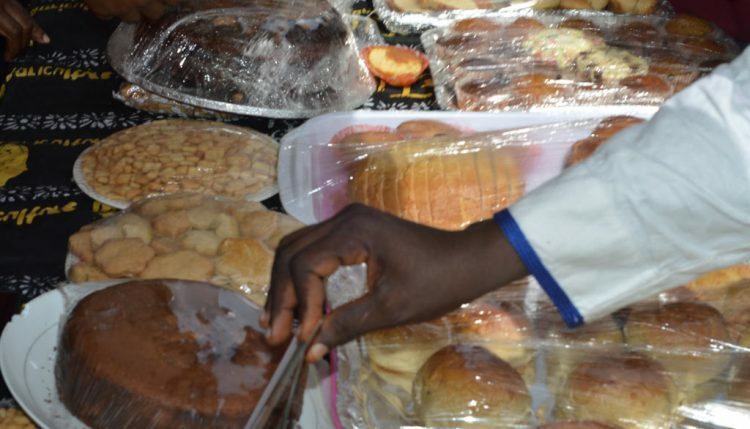 Some of the baked goods exhibited by IITA at the event include yam and banana composite-cake and bread and cassava composite-doughnuts, pizza, chin chin, bread rolls, and queen cakes. Also, information, education, and communication materials on strategic technologies being promoted by IITA as well booklets about IITA Youth Agripreneurs were handed to dignitaries and visitors to the IITA exhibition stand. Some of the participants requested for contacts and information on how they can be trained on yam and cassava by-product development.